10 Of The Weirdest Things To Ever Happen On Public Transport. Vandalism is a serious offense just about everywhere you go. It generally leads to unwanted altercations on public property that end up ruining the object for everyone else. Violators that do it tend to be selfish people or those that don’t care about anyone else’s property outside of their own. That being said, there are cases of vandalism that we can’t help but chuckle at. Most of them are harmless pranks that advertisers or companies may not like, but it’s made more in a joking jab. 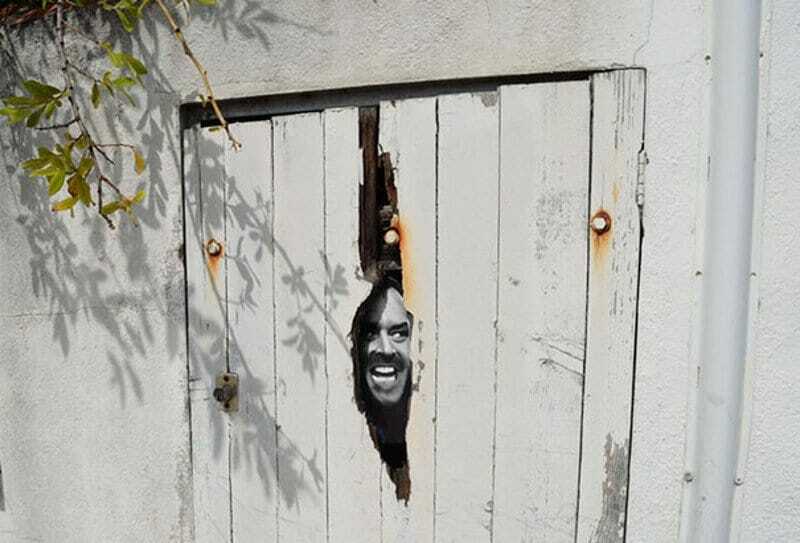 Here is some of the most brilliant vandal work we’ve ever witnessed. This is one of the simplest forms of vandalism that isn’t even costly. The coolest thing about these weird pictures and symbols in public areas is they can be construed as completely different things, and somebody took drying hands as clapping to a jellyfish. 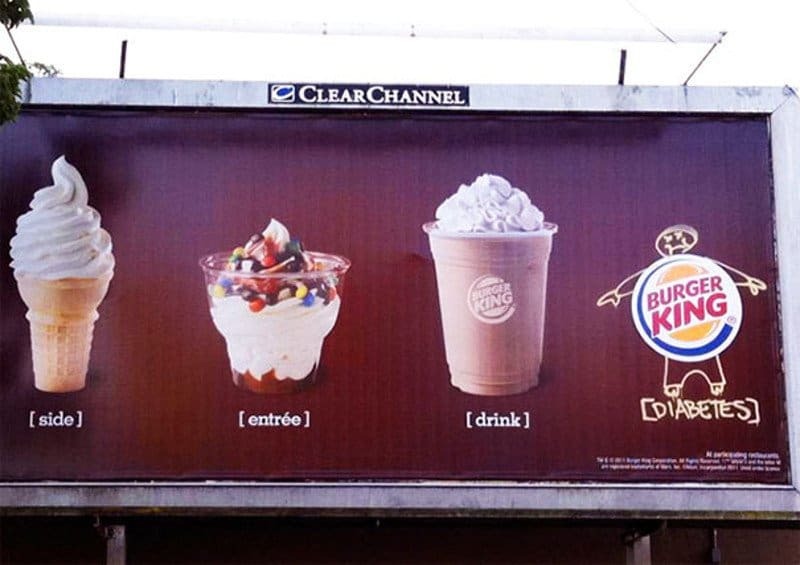 We don’t really know where Burger King was going in this billboard advertisement depicting a meal that consisted of ice cream, more ice cream, and a mocha frappe. But the person who drew a heavy man out of the BK logo and added diabetes is on point. 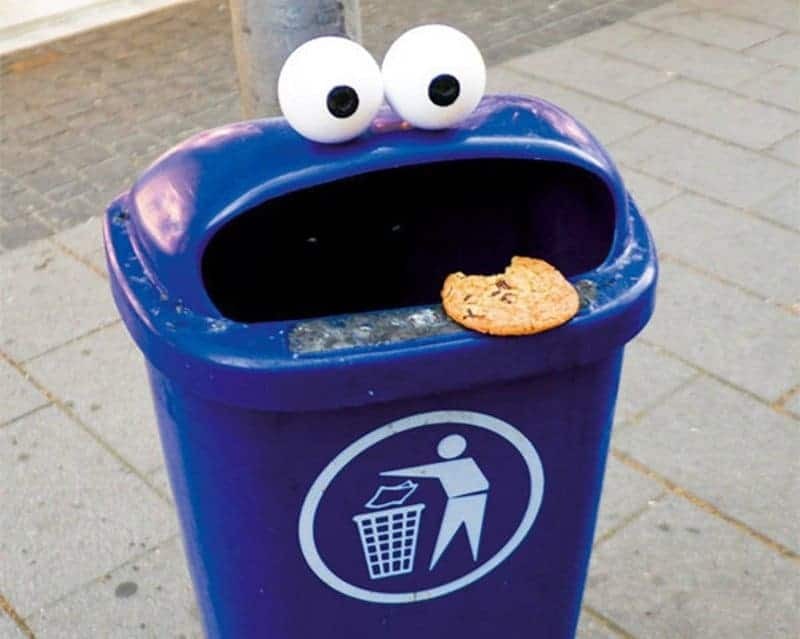 Here’s an innocent prank of sticking two bulgy eyes on top of a blue garbage can and then putting a cookie that was bitten into on the rim. It’s a shame that a cookie looking that good was wasted by being placed on such a gross garbage rim. This was found inside of a men’s bathroom, and it depicts the infamous scene from E.T. 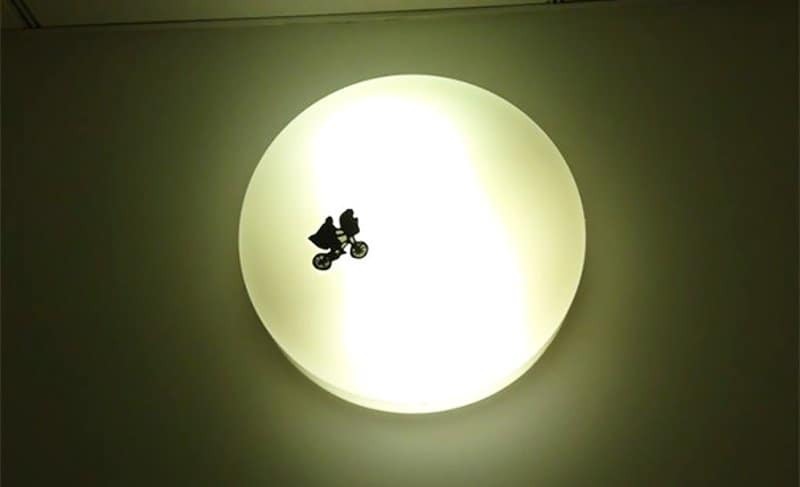 the Extra-Terrestrial that shows Elliott riding his bike with E.T. in the basket as they fly in the air. This was also the logo of director Steven Spielberg’s motion picture company, Amblin Entertainment. It’s a simple yet cool illusion of depicting a brick as a horrified human face. 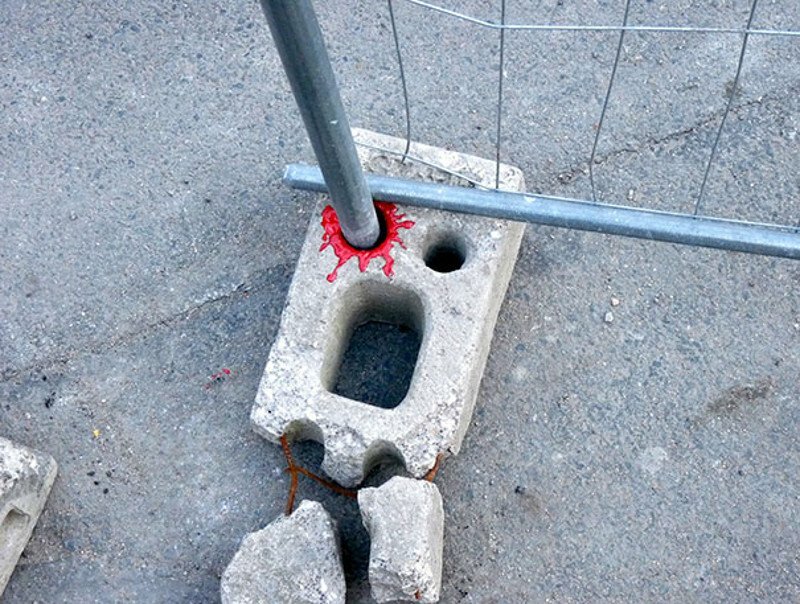 A steel fence pole is jabbing into the face’s eye with blood splurting out and there’s a reaction of pain and agony. 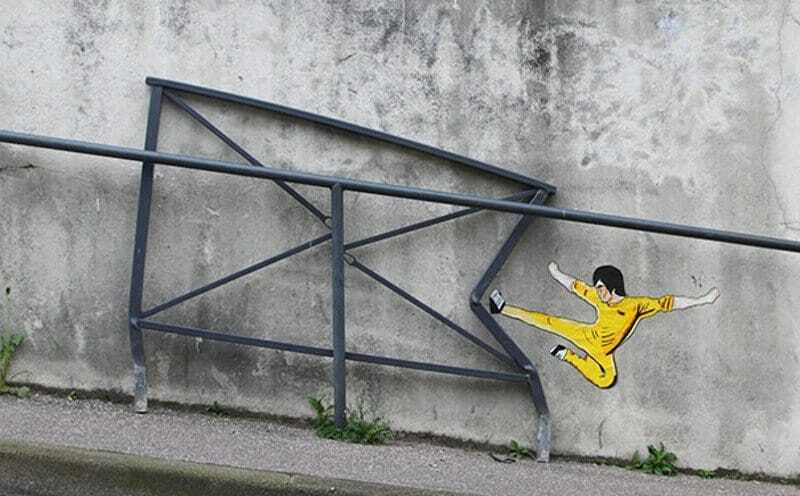 Here’s a cleverly-placed karate kicking man next to some railings that are completely bent out of shape. Martial artists and just artists in general should be impressed by this visual treat. 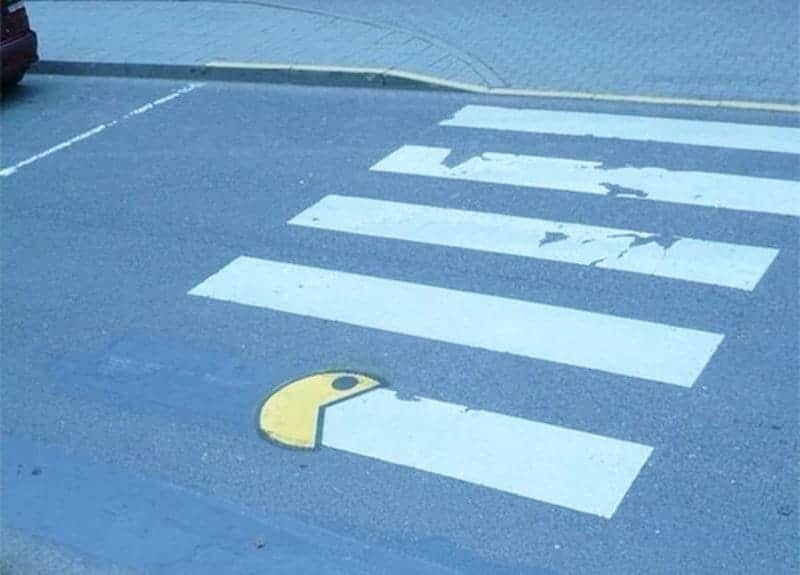 It might not be the little dots like in the arcade game, but Pac-Man has evolved into eating some street paint. We don’t know if the white bars were fading or were colored over on purpose, but it still ended up being pretty cool. Many of you have seen the weird commercial that depicts a normal-looking Johnny Depp saying and doing weird things, which somehow led to him promoting a fragrance. 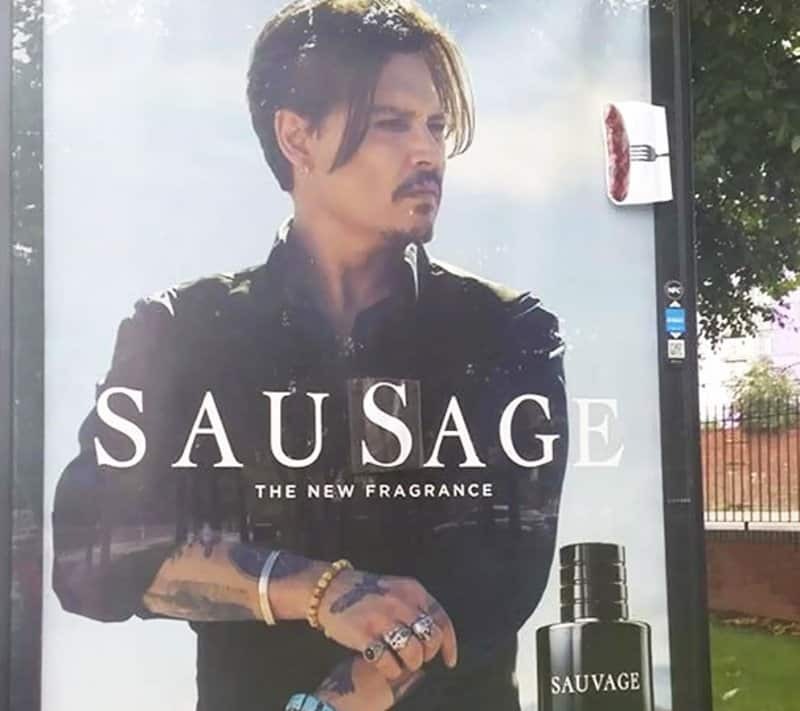 While the person forgot to cover up the bottle too, we’ll give him points on giving the cologne a better title and a great picture add-on. 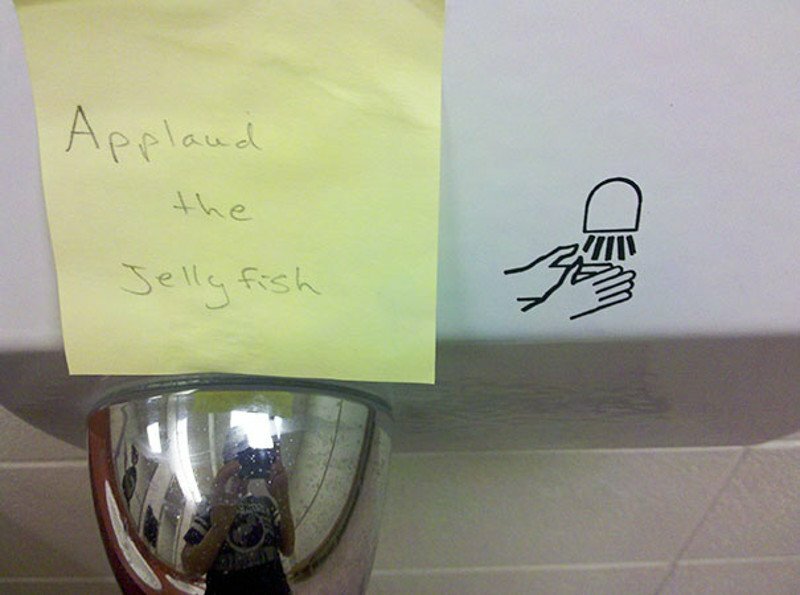 Another hilarious stunt that’s similar to “applaud the jellyfish” is using the wet floor symbol as snakes. One streak, or snake, nips at the man’s leg. 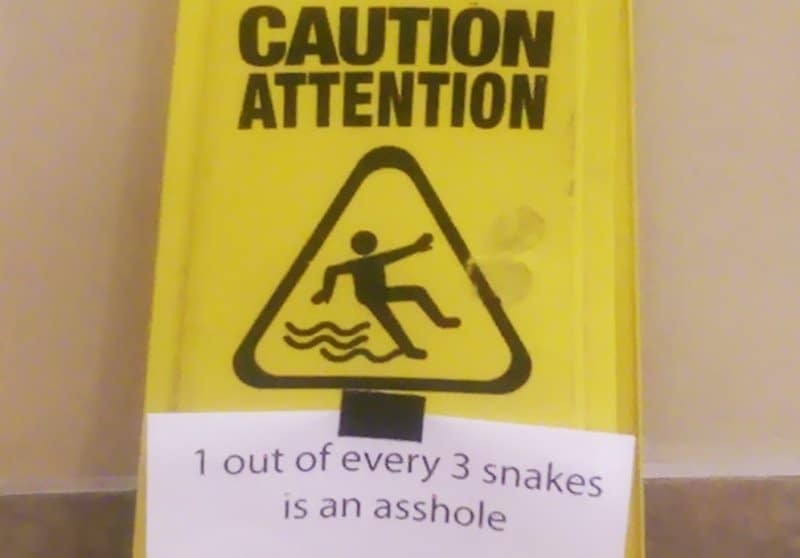 The snake might be considered an a**hole, but maybe the stick figure shouldn’t be hanging around the creatures. One of the creepiest scenes that Jack Nicholson played in throughout his movie career was the “Here’s Johnny!” moment in The Shining. The art is so lifelike that we can’t even tell if it’s a real door or not.